River Ranch, is located within a village south of the Vermilion River is the city of Lafayette. 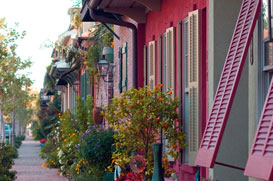 The village has approximately 2,553 residents and contains diverse architectural styles. From Caribbean to French, American Colonial, Acadian, Creole, Neoclassical Revival and Spanish, each style provides distinct characteristics. The homes in River Ranch may range from condominiums to townhouses. River Ranch homes for sale provide an interesting selection that is focused more on architectural integrity than size. The homes include apartments, townhouses and condominiums built above commercial and retail businesses in Town Center, providing an advantageous location for young professionals. River Ranch includes homes with front porches to promote socializing between neighbors. The homes in Town Center are the preference of many CPAs, lawyers, architects, dentists and doctors as well as other professionals. A venue for the performing arts and restaurants as well as retail businesses provides a location that is preferred by many. This area allows residents to enjoy a number of recreational and entertainment options. The Village Wine Festival and Art Festival in addition to Rhythms on the River and various other musical performances and concerts are just a part of the activities that draw residents and visitors to the area. River Ranch homes for sale include many single-family residences with outside kitchens, fireplaces, formal living and dining rooms and whirlpools. The homes provide plenty of space for families with some over 4,000 square feet. Amenities include a health club, The City Club at River Ranch, nearby shopping at the Shops at Main Street, Parc Lafayette, and more. Tennis courts, playground, and a River Spa are among other amenities River Ranch has to offer. As a choice for families, retirees, young professionals and others, River Ranch provides numerous opportunities for living, working, entertainment and the lifestyle desired by many.